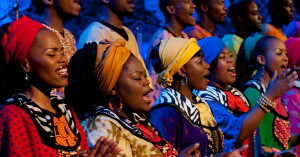 Celebrate the season of giving with the inspirational power of South African gospel music. Dazzling and unified. . . Soweto Gospel Choir was as much to look at as to listen to. The human spirit—this you couldn't miss! —The Los Angeles Times Matinee and Evening Shows! December 20 4:00 p.m. and 7:00 p.m. General Admission $25, Preferred Seating $40, VIP Seating $50 Tickets and further information at jacobspresents.com. Here's a nice video on the National Public Radio website.